Rio Grande’s Stanley Christian (3) had 17 points and 11 rebounds in Thursday night’s 85-62 win over Midway University at the Newt Oliver Arena. The RedStorm snapped a three-game losing slide with the victory. 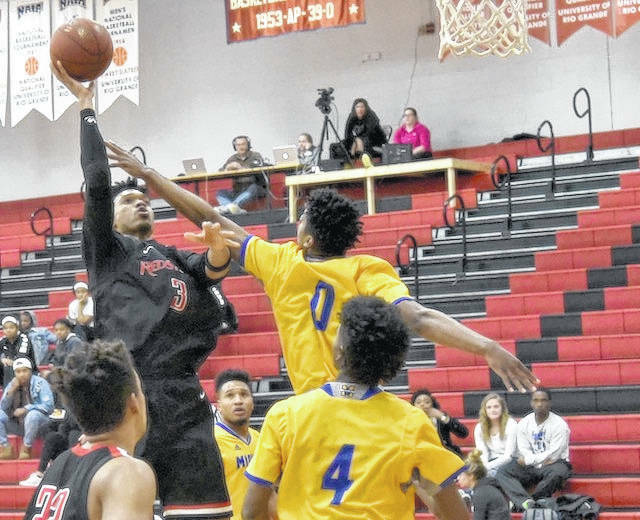 RIO GRANDE, Ohio — The University of Rio Grande men’s basketball team came up with a rather emphatic way to end its three-game losing streak. The RedStorm scored the game’s first 18 points, built a 30-point first half lead and cruised to an 85-62 win over Midway University, Thursday night, in River States Conference action at the Newt Oliver Arena. Rio Grande improved to 8-12 overall and 3-5 inside the RSC with the win. Midway, which suffered a fourth straight loss, dropped to 5-12 overall and 2-7 in conference play. Senior guard Will Hill (Worthington, OH), who was honored in pregame ceremonies with the 9th Annual Corey Taylor Heart and Hustle Award, scored 11 points in the game’s first 5-1/2 minutes as Rio built an 18-point lead. The Eagles finally got on the scoreboard thanks to a conventional three-point play by Jose Bustamante with 13:41 remaining in the first half, but the RedStorm continued to pull away and built a 30-point lead, 47-17, following a three-pointer by sophomore Cameron Schrieter (Mason, OH) with 2:09 left before intermission. Rio settled for a 26-point at halftime, but enjoyed its largest lead of the night, 72-39, after a bucket by sophomore Stanley Christian (Norfolk, VA) with 11:30 left in the contest. Midway got no closer than 20 points the rest of the way. Hill finished with a game-high 28 points, four assists and four steals to lead Rio Grande, while Christian finished with 17 points and a game-high 11 rebounds. Junior Abe Eze (Lagos, Nigeria) narrowly missed a double-double effort of his own in the win, finishing with 11 points and nine rebounds. Schreiter tallied a career-high nine points for the RedStorm, all of which came in the first half surge. Rio Grande shot 54 percent in the opening half (19-for-35) and 45.8 percent for the game (33-for-72), including a 10-for-24 effort from three-point range. The RedStorm also out rebounded their guests, 46-33. Midway was led by DJ Townsend’s 14 points, while Bryson Harris netted 10 points and Kwon Evans finished with nine points and a team-high five rebounds. The Eagles hit just five of their first 19 shots and committed 10 of their game total 18 turnovers in the opening half. Rio Grande returns to action on Sunday when RSC West Division leader Alice Lloyd College visits for a 4 p.m. tipoff.